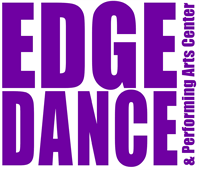 ENROLLMENT: Enrollment in a class or classes requires full payment of a non-refundable $35 (FALL) $25 (SUMMER) registration fee ($30/$20 for returning students who have attended Edge Dance & PAC within the past 12 months) and the first month's tuition. Class sizes are limited therefore monthly class tuition is not based on attendance, it simply holds your spot in a class. Edge Dance reserves the right to cancel class or combine classes with another appropriate class when enrollment is low. INSTRUCTORS: Edge Dance & PAC carefully selects qualified instructors for all ages and levels of our dance and theatre program. Edge Dance reserves the right to substitute or change instructors at anytime as it feels is best for our program. TUITION: Tuition is paid monthly. Tuition is paid to hold a student's place in a class or classes, and must be paid regardless of the student's attendance each month. Monthly tuition is based off of our full Fall/Spring season which runs from August-June. Some months will have five weeks of class while others have less; however, monthly tuition will remain the same. Please remember you will not be sent a statement. Tuition is due on the first of each month and considered past due if not paid by close of business on the 5th of the month. A $25 late fee per student will automatically be billed to all late accounts at 9:00pm on the 5th of each month. If tuition becomes two months delinquent students are subject to removal from classes. PAYMENTS: For your convenience, you may have a credit card on file to be charged monthly for tuition and other fees to include costume and recital fees. If you choose not to participate in automatic draft, you are still required to provide a credit card to secure the account. If no credit card is available, you must then provide first and last month's tuition. Edge Dance & PAC reserves the right to apply any unpaid tuition or past due fees to the credit card on file at any time. MAKEUP CLASSES: Missed classes may be made up in any class of your choice as long as tuition is current. No reductions or refunds are given for missed classes. Students must obtain a "Make-Up Class Card" from the office and turn it in to the instructor of the make-up class in order to avoid an added charge to their account. Make-ups need to be made in the month missed, whenever possible. CLASS CHANGES: Students may not add or change a class without first notifying the office. A $20 drop-in charge will be added to their account if a student is found taking a class in which they are not enrolled. HOLIDAYS: Check website or ask office for exact dates. Please remember there is no pro-rating for holidays. LOST AND FOUND: Items lost in the studio are only kept for 30 days. Please check regularly as items are cleaned out and donated monthly. We will not be held responsible for lost or stolen items. SAFETY: We are not responsible for students before and after their class time, and after they exit the studio. Please instruct your child to remain inside the studio for the duration of their time here at Edge Dance & PAC. Students should be dropped off no more than 10 minutes before class and promptly picked up after class. DRESS CODE: Any dancer not adhering to the Edge Dance & PAC dress code will not be allowed to participate in class. Please review our class descriptions and attire requirements, available online or at the front office. All dancers should wear cover-ups when arriving and leaving the studio. WITHDRAWALS: Students are continually enrolled in classes from month to month unless 30 days prior written notice is given. If a student wishes to drop any or all of their classes, 30 days written notice must be received in our office or the following month's tuition will still apply. This notice is required for class/staff scheduling purposes as well as removal time from auto billing services. All balances and payments must be current upon receiving written notification from the parent or guardian. A student who drops and wishes to return within the same studio year will be responsible for the re-enrollment fee of $20. SPRING RECITAL: All students are expected to participate in the Edge Dance & Performing Arts Center spring recital which is held in June. Spring recital and costume fees will be billed to your Edge Dance account. Costume fee of $95 per class is due in November and recital fee of $95 per student is due in February. No refunds will be given on costumes or recital fees. All balances must be up-to-date for students to participate in year-end recital. Students must attend all rehearsals for the two weeks prior to recital. Edge Dance & Performing Arts Center is dedicated to offering the highest quality dance and performance education for your child and we appreciate your cooperation with these procedures. 4. I/WE HEREBY RELEASE, WAIVE, DISCHARGE AND COVENANT NOT TO SUE the dance facility used by the participant, including its owners, managers, promoters, lessees of premises used to conduct the dance event or program, premises and event inspectors, underwriters, consultants and others who give recommendations, directions, or instructions to engage in risk evaluation or loss control activities regarding the dance facility or events held at such facility and each of them, their directors, officers, agents, employees, all for the purposes herein referred to as "Releasee"...FROM ALL LIABILITY TO THE UNDERSIGNED, my/our personal representatives, assigns, executors, heirs and next to kin FOR ANY AND ALL CLAIMS, DEMANDS, LOSSES OR DAMAGES AND ANY CLAIMS OR DEMANDS THEREFORE ON ACCOUNT OF ANY INJURY, INCLUDING BUT NOT LIMITED TO THE DEATH OF THE PARTICIPANT OR DAMAGE TO PROPERTY, ARISING OUT OF OR RELATING TO THE EVENT(S) CAUSED OR ALLEGED TO BE CAUSED IN WHOLE OR IN PART BY THE NEGLIGENCE OF THE RELEASEE OR OTHERWISE. 8. I authorize Edge Dance & Performing Arts Center to use photographs, video, and/or other likenesses of myself or my child(ren) for use in its promotional materials or sales and waive any rights of compensation or ownership thereto. Students who enroll in camps (Summer, Winter, Spring Break or Other) will be automatically dropped from enrollment when their camp is completed unless they have enrolled in additional ongoing classes. A non-refundable deposit is required to hold your spot in camp and balance must be paid in full prior to the beginning of the camp. See specific camp for details regarding deposits and balance due dates. By checking this box I agree that Edge Dance & Performing Arts Center has permission to charge my credit card on file for items including, but not limited to... registration fees, tuition, late fees, recital fees, costume fees at any time if there is an outstanding balance on my account. I understand that Edge Dance & Performing Arts Center will send any accounts which are 60 days past due to collections. In the event that your account is sent to collections, you agree to pay 100% of any collection fees.